The Segway® Robotic Mobility Platform (RMP) takes the performance and engineering prowess demonstrated in the Segway® Personal Transporter (PT) and makes it available in a durable package for robotics applications. The Segway RMP is an extremely reliable and customizable transportation platform that is suitable for moving heavy payloads in tight spaces over a variety of terrain. The Segway RMP product line uses the same components that enabled a Segway PT rider to travel more than 4,000 miles across the United States. These components were designed and tested to be highly reliable and durable, making the RMP ideal for service applications. Each Segway RMP model is battery powered and emits only a slight harmonic hum when the drive motors are active. It also has an onboard charging system and is controlled via a simple USB or CAN serial bus interface. Custom interfaces are also available. The Segway RMP base is well sized to augment or replace human power in a variety of applications. Its motors are capable of producing 2 HP continuously and can peak at 4-5 HP as needed-powerful enough to carry a human-sized payload. Segway RMP models are available in a variety of battery and tire/wheel combinations and offer a range of up to 15 miles / 24 km and payload capability of up to 400 lbs / 181 kg. The Segway RMP runs on one to four NiMH or li-ion battery packs. Each Segway RMP can be powered by any electrical energy source provided it produces 52 volts. In fact, the Segway RMP may be out?tted with a compact gas generator to charge the batteries while in use. Segway RMPs have a propulsion base that is found in other Segway products currently in the marketplace. Some models include support frames for custom sensing devices and computing hardware, casters for statically stable operation, or connection points for attaching one Segway RMP to another. Modular capability within the Segway RMP product line enables a small number of units to be reconfigured as needs change. 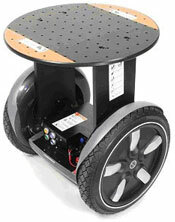 The Segway Robotic Mobility Platform is available for delivery to commercial customers now. To receive additional information about the Segway RMP, please contact Authorized Segway dealer.